A small group of children on Horai Island watch as a Kikyo look-alike develops in a green orb, then stand in front of the Cauldron of Resonance while it comes to life. Four scars, the mark of the Four War Gods (Ryuura, Juura, Kyoura and Goura), appear on all of the children's backs except for the youngest girl, Ai. Asagi, the oldest, tells Ai to leave the island while she still does not bear the mark. 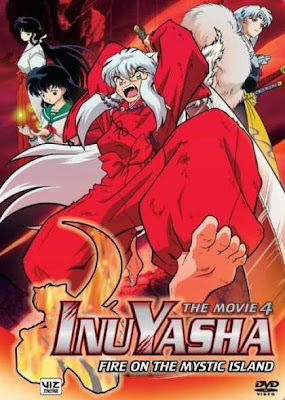 After Ai leaves, The Four War Gods find out that Ai has escaped and try to retrieve her, but InuYasha and the others defeat Goura and save Ai, who asks InuYasha to save the others on Horai Island. Later, InuYasha explains the myth of Horai Island, a place that appears once every fifty years. He remembers fifty years ago, when Kikyo took him to the island to meet the half-demon children. Suddenly, the Four War Gods appeared. Gora sucked some of Kikyo's blood (which was used to make Kikyo's doppelganger), and Ryuura marked InuYasha's back with the scar, saying that he would never be free from them once he has the scar on him. The gang decides to head to Horai Island to investigate. The villagers panic upon seeing the island. In a small hut, Kikyo listens to a man's tale of Horai Island, then leaves, saying she will defeat the demons. The rest of the villagers rush to the shrine and start praying for divine protection when Kyoura appears, who proceeds to burn down the shrine and kill many of the villagers. Sesshomaru arrives and drives Kyoura off with his Dragon Strike. After the battle, he remembers back to his first encounter with Kyoura, when he was marked by the scar. As InuYasha and company near the island, Juura appears and fires his Thunder Cannon at them, destroying their boat. Miroku and Sango fly away on Kirara, pursued by Juura, while InuYasha, Kagome and Ai escape to the beach, where they meet Ryuura. In the ensuing fight, Ryuura easily deflects InuYasha's Wind Scar with his Earth Dragon Gale, then calls upon his Dragon Lightning and nearly kills InuYasha, but Kagome stops him by firing a sacred arrow. Ryuura is forced to retreat, but not before he hurls some insults at InuYasha.